The Slug Queen was first conceived in 1983. Cynthia Wooten, a city councilwoman, was discussing the idea of the very first Eugene Celebration with then City Manager Mike Gleason who wanted to name the city festival simply the "Eugene Celebration." Wooten, along with Karl Eisenach and Paul Olswang argued for the name "Slugfest," but this was turned down by the rest of the City Council. Alana Probst organized the first Slugfest as an alternative to (and parody of) other cities' beauty pageants in her own backyard where the first Slug Queen was elected. The rebel group then entered a parade float in the first Eugene Celebration Parade shaped like a giant Slug with the first Slug Queen, a man named Bruce Gordon, riding in drag on it. This movement was in direct opposition to the wishes of the rest of the city council but was instantly popular with the crowds. The Slug Queen Competition and Coronation grew to be an annual event. Rather than perpetuating typical beauty queen standards, the originators chose as their emblem a life form more in keeping with the Pacific Northwest's soggy climate and Eugene's iconoclastic spirit: the humble slug. 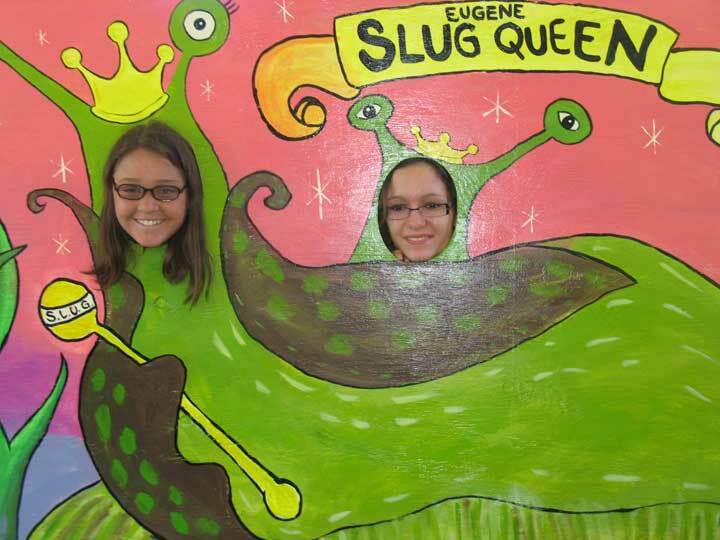 Since 1991, the Slug Queen coronation has been organized by Kim Still, who is the manager of the Eugene Saturday Market. The SLUG Queen, slug queen, or S.L.U.G. Queen , is a humorous character concept considered to be the unofficial goodwill ambassador of the City Of Eugene, Oregon, United States. The Slug Queen presides over many popular events in Eugene, including the Eugene Celebration, an alternative festival, which takes place annually. Her float is the highlight the accompanying parade. However, the Slug Queen is not officially connected with the Eugene Celebration despite popular opinion. In fact, the Slug Queen concept was born as a direct response of opposition to the Eugene Celebration name and has always remained outside the domain of the official celebration. A new 'raining' Slug Queen is crowned in August. The queen is named "slug" in order to suggest images of the Willamette Valley region's lush leafy gardens full of snails and slugs and as a humorous play on other local queens, often selected for beauty, as opposed to wit and audacity.